AT&T is working to make it’s internet signal strength stronger. No one that has AT&T service would stop them in their quest. Here’s how they want to do it. 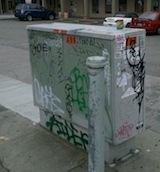 A box similar to the one at the right installed on sidewalks around the city. AT&T is working on a categorical exemption from Environmental Review. That means they can do it without your input, so if they want to put one on the public sidewalk in front of your home, they can-and you can’t do anything.